Just a few moments ago, the Google+ team introduced Pages to help you better get to know your favorite brands, businesses and organizations. But the exciting news doesn’t end there! 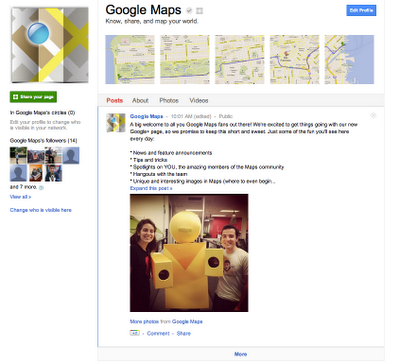 Today, we’d like to welcome all fans of Google Maps to join us on Google+ by adding our new page to your circles. Product news and announcements. Stay up to date and share with friends. Hangouts with the Maps team. Bring your questions! User spotlights. We want to showcase you, our awesome community members. #GMapsTrivia. Put your geo skills to the test for bragging rights. Pro tips. Tricks from Googlers and fellow users so you can get the most out of Maps. This page is a place for you to connect with our team and other Maps fans, discuss ideas and share feedback, and learn a new thing or two about our product. So say hello in the comments on our page, and we’ll see you soon in a Hangout!